VOIP (Voice over Internet Protocol) is a protocol used for the transmitting voice through the Internet or other packet switched networks. VoIP is often used to refer to the transmission of voice . VoIP is also known as Internet telephony,Â Broadband Phone. 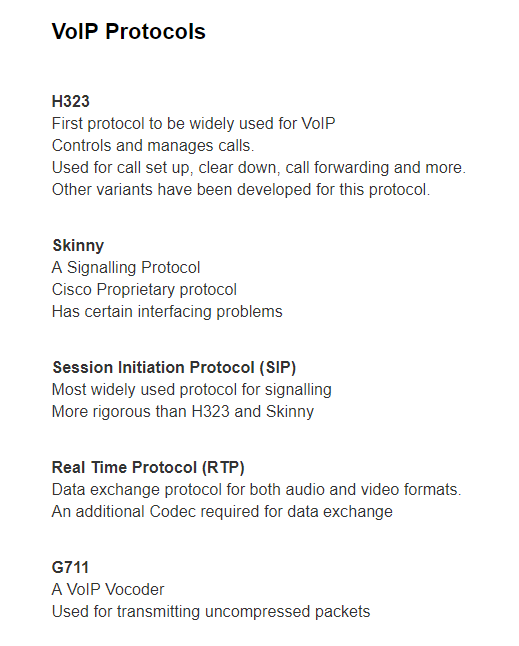 VOIP is pronounced as “voyp”. Companies providing VoIP service are commonly referred to as providers, and protocols which are used to carry voice over the network are commonly referred to as VoIP protocols. They may be viewed as commercial realizations of the experimental Network Voice Protocol implemented in 1973 for ARPANET. Cost savings is due to using a single network to carry voice and data, where users have existing unutilized network capacity that can carry VoIP at no additional cost. VoIP to VoIP phone calls are often free, while VoIP to public switched telephone networks, may have a cost that is paid by the user. VOIP transmit telephony signals as digital audio signal, typically reduced in data rate using speech data compression , encapsulated in a data packet stream over IP. Voice Over Internet Protocol (VoIP) is a protocol that allows the transfer of all other multimedia formats over networks that carry internet protocols (IP). VoIP is enabled in a Â system by integrating various technologies and protocols that are used to carry voice formats over the internet, LAN and WAN. Basically, a VoIP system consists of two or more end devices that are either phones, PCâ€™s or similar devices, and also an IP network over which the voice data is carried. The phone or PC will have a voice encoder/decoder at one end, which converts the voice data from analogue format to digital format and vice versa. A compression process is also carried out to encode the voice format and a decompression process decodes the voice format. A network interface card is used to break the data obtained into small packets and is also used for signal warning and call control in such a way that many basic actions like locking a call, closing a call and so on can be carried out. The Internet Protocol network receives the call and helps in redirecting them through the right path so that the calls reach the end user. VoIP also helps in data saving by rerouting data by sharing the â€œquiet periods in between conversationsâ€ with other users. This makes the system more efficient and saves data for all the users. The basic working of VoIP includes converting analogue signals (voice) into digital format while complying the internet protocols so that they can be transferred via the internet. If two people are calling each other, but one of them is making an internet call, while the other user is making a plain old telephone call, then the latter personsâ€™ conversation has to be converted to an analog signal. When the person who is speaking is connected to a telephone line, the VoIP technology converts the signal again to make what is known as the â€œlast mileâ€. The voice signals can be sent over either the public internet or through a private circuit. In the private circuit configuration, VoIP works by bypassing the â€œlast mileâ€ to provide the best digital service. For the user, all he has to do is add a VoIP compatible device to make calls, add a software and use a headset. The user must also look out for a stable high speed internet connection that doesnâ€™t create any delays in online talks. A QoS modem is required to bring priority to internet based VoIP calls over other data transfers, over the same internet protocol, and that too in real time. These modems must carry a Quality of Service to make a data exchange without any delays in real time. If such delays occur, the video and sound will not be synced and there will even be instances where video cannot be perceived (frozen screen) for quite some time. This short section requires expansion. As the first computer networks were realized Voice over Internet Protocol has been a matter of interest. By 1973, voice was being transmitted over the Internet. The technology for transmitting voice conversations over the Internet has been available to end-users since at least the 1990’s. In 1996, a software productÂ called Vocaltec Internet Phone ReleaseÂ provided VoIP, along with extra features such as voice mail and caller identification. But it did not offer a door to the analog POTS, so it was only possible to speak to other Vocaltec netÂ phone users. By 1997,Â soft switches were designed to replace a traditional hardware switching blocks by acting as theÂ door between two telephone networks. Replacing the good old phone lines with VoIP brings in huge cost reduction and high affordability. Apart from the default voice messaging and calls, VoIP helps in video conferencing, data sharing and voice calls, all of them being unlimited. All you need is a steady and speedy broadband or mobile data connection. There is no additional or hidden costs in maintenance or installation of VoIP. The biggest disadvantage is that VoIP completely depends on internet connectivity. If your broadband gets disconnected due to any particular reason you are literally out of VoIP use. As VoIP calls consists of a lot of compression and decompression techniques to bring in end to end security through encryption and decryption, there is a good chance of delays in video calls. Wow! What a website. You have a real knack for making a blog readable and easy on the eyes. Some sites look like train wrecks, but not this one – it’s a pleasure to read. I find wireless phone technology very interesting. I have learned a lot in implementing a small VoIP network at home, and am thinking of starting VoIP business in my area. There are a number of small businesses in my region that would benefit from it greatly. I searched for \’Voice Over Ip Phone Service Voip Telephone Internet\’ at google and found this your post (\’\’) in search results. Not very relevant result, but still interesting to read.